Rev. Joseph Kassab, Secretary General of the National Evangelical Synod of Syria and Lebanon, was unanimously elected this morning as Head of the Supreme Council of the Evangelical Community in Syria and Lebanon, succeeding Rev. Salim Sahyouni. Furthermore, Rev. Samuel Hanna was re-elected as Vice-President of the Council for a new term. Rev. Makardij Karakozian was appointed as Secretary of the Family, Rev. Milad Dagher as Secretary of Finance, Rev. Samuel Hurt was appointed, Judge Sheikh Fawzi Dagher was a human rights adviser. The elected members of the National Evangelical Synod of Syria and Lebanon were: Revs. Edgar Trabolsi, Habib Badr, Emad Zouroub, Leon Maqsoudian, Andraous Salama, Fouad El Masri, Ibrahim Nasir, Salim Sabounji. The General Assembly also unanimously voted that Rev. Salim Sahyouni be the honorary president of the community. We extend our many thanks to Rev. Salim Sahyouni, for all his efforts to serve the Evangelical community for years. We also congratulate Rev. 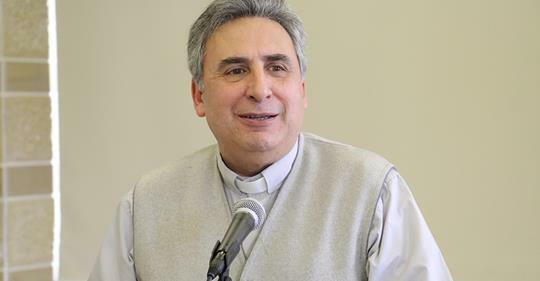 Joseph Kassab on his assumption of the presidency of the Council and wished the Lord to bless his ministry and his new responsibilities for the growth of the community. We also wish to congratulate Rev. Samuel Hanna on his retaining the undertaking of the Vice-President.